My family friends and I served the guys at the Guest House of Milwaukee tonight and, while that was as satisfying and energizing as ever, I was jazzed up by a couple of other small points of light outside their doors. 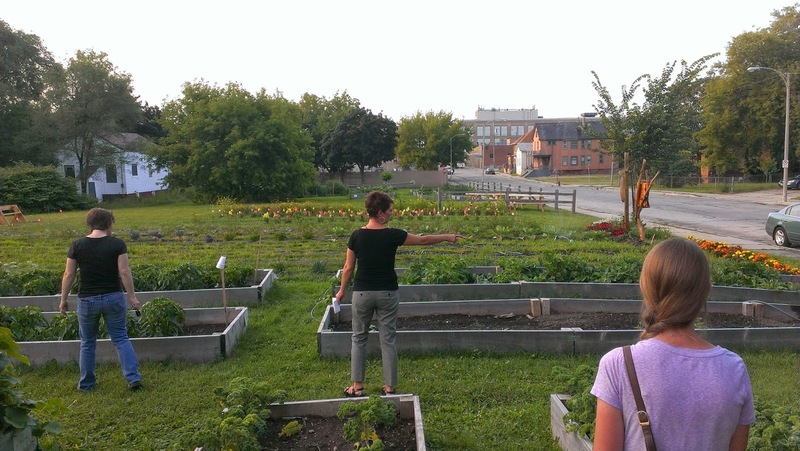 The Guest House has built a series of raised garden beds outside their building. It's been there a few years, but I got a much better look at all of the vegetables and flowers that are coming out of this agency's efforts. Beautiful looking lettuce, corn, onions and other veggies all flourishing in the heart of the city. I think the entire crop will be used by the Guest House for meals for the men and it is maintained by a few of the residents. The neighborhood residents seem to respect the area as "sacred ground" and it is a really cool gem in the middle of an area hit hard by poverty. The other part of the equation though is the newest addition to the garden. 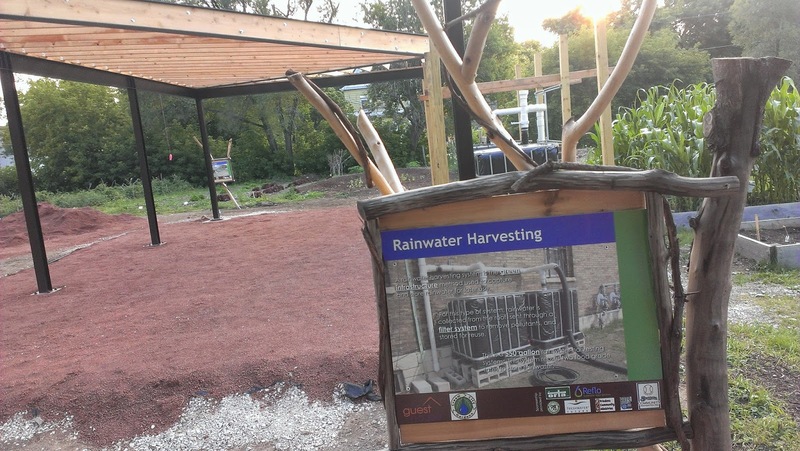 A rainwater harvesting system was funded by the Milwaukee Brewers, including Rickie Weeks and Jean Segura. The construction isn't completed yet, but it is a marvelous structure with lots of green technology within it. Near as I can tell, the soon to be completed roofed overhang will funnel water into two large containers. From there the "brown" water can be used to water the raised garden beds during times of dry weather and/or drought. It looked like there was much more to the whole system than I'm explaining here, and I aim to find out more specifics as soon as I can corner my friend who works at the facility. The reason I'm so pumped about this project is it's such an exponentially positive thing. It's a "green" water gathering system to divert water from entering the Milwaukee deep tunnel, that is used to water vegetables that don't have to be trucked from out of state, that are used to feed homeless men. So why does this kind of thing get me excited? Because I think of all of the possibilities it holds for the rest of our city. It is this kind of Will Allen forward thinking, eco-minded, job creating mentality that keeps me going. When I see all of the rotten things happening in the world, jets getting shot out of the air, Israeli/Palestinian conflict, etc., it does nothing but drag me down. 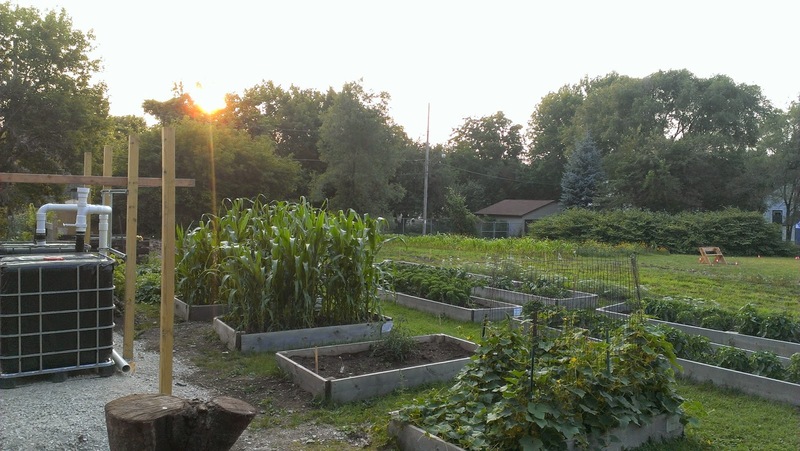 So when I see something that is so insignificantly positive as a garden grown by men trying to work through their temporary situation, I begin to see the light of God at work. I know that sounds cliche', but there's no other word for it. People were called to do this, to fund this, to build this, to foster it, and I'm a believer that God has a hand in it as well. It spurs me to think of how awesome it could be if we had one of these in every neighborhood in the city, in every city in the world. There's so much good that could be done if the money we spent as a nation building rockets and bombs was spent on good. I know it's idealistic and probably highly unrealistic, but if I can't hope for things like this, what's the point? I've got to believe that as a culture we're better than what we've proven in the past. Or at least that's my hope. It hit me the other day for some reason, as it seems to do a lot lately, that we are only here for a short time. A very short time. And I firmly believe that God put us here and said "There, go make a difference in the world. Do it in your job, do it in the way you raise your family, do it in how you influence your circle of friends, do it in your neighborhood, your schools, but most of all, make a difference in how you treat others. Donate, volunteer, help, lend a hand, say yes, give money, give time, give training. Have a better story than to say, 'I lived safe, rich, overindulged and self satisfied'. Go make a difference." And that's why I'll continue to go and pour soda, schlep Nescos full of hot food up and down stairs, and wash dishes in a kitchen too small. I don't mention any of this it because I want accolades, because if I don't do it, theres sure enough someone else that will. But if I DO do it, that leaves them to do something else to make our world, our city, our neighborhood a better place. That's part of the reason I take my kids along with to help out. Because, I'm a firm believer that everyone has a role. I couldn't agree more! Feed the hungry, clothe the naked, care for the widow and orphan. It's these simple things which require our most precious commodity - time - and which do the greatest good.